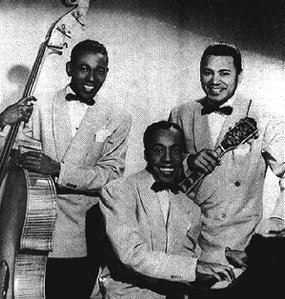 Above: At the time of this record, The Three Peppers consisted of Oliver "Toy" Wilson (piano), Bob Bell (guitar) and Walter Williams (standup bass). The above photo shows a later line-up after Roy Branker replaced Wilson on piano. Above: Recorded 5/2/40. 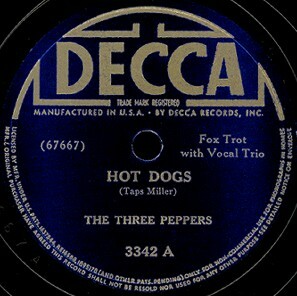 The Three Peppers first recorded several sides for the Variety label in 1937 before moving to Decca in 1938. They recorded for Decca from 1938 to 1940, then only two later records... one on Decca in 1947 and one on Gotham in 1949. Click on an option below to listen to "Hot Dogs" using RealPlayer.